One way that people may choose to cope with stress is by turning to alcohol. Drinking may lead to positive feelings and relaxation, at least in the short term. Problems arise, however, when stress is ongoing and people continue to try and deal with its effects by drinking alcohol. Instead of “calming your nerves,” long-term, heavy drinking can actually work against you, leading to a host of medical and psychological problems and increasing the risk for alcohol dependence. 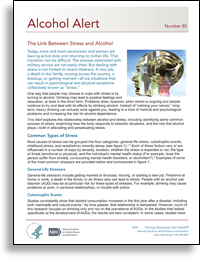 This Alert explores the relationship between alcohol and stress, including identifying some common sources of stress, examining how the body responds to stressful situations, and the role that alcohol plays—both in alleviating and perpetuating stress. 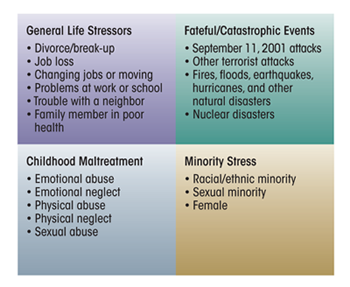 Most causes of stress can be grouped into four categories: general-life stress, catastrophic events, childhood stress, and racial/ethnic minority stress (see figure 1).1,2 Each of these factors vary or are influenced in a number of ways by severity, duration, whether the stress is expected or not, the type of threat (emotional or physical), and the individual’s mental health status (For example, does the person suffer from anxiety, co-occurring mental health disorders, or alcoholism? ).3 Examples of some of the most common stressors are provided below and summarized in figure 1. General-life stressors include getting married or divorced, moving, or starting a new job. Problems at home or work, a death in the family, or an illness also can lead to stress. People with an alcohol use disorder (AUD) may be at particular risk for these types of stresses. For example, drinking may cause problems at work, in personal relationships, or trouble with police. Figure 1 The four categories of stress. Studies consistently show that alcohol consumption increases in the first year after a disaster, including both manmade and natural events.1 As time passes, that relationship is dampened. However, much of this research focuses on drinking only and not on the prevalence of AUDs. In the studies that looked specifically at the development of AUDs, the results are less consistent. In some cases, studies have found no increases in AUDs among survivors after events such as the Oklahoma City bombing, September 11, Hurricane Andrew, or jet crashes. However, other studies of September 11 survivors have found that AUDs increased. This trend was similar in studies of Hurricane Katrina, the Mount St. Helens volcano eruption, and other events. Most of these studies included only adults. Additional studies are needed to better understand how adolescents and young people respond to disasters and whether there is a link to alcohol use. The hormone cortisol has a key role in the body’s response to stress. One of cortisol’s primary effects is to increase available energy by increasing blood sugar (i.e., glucose) levels and mobilizing fat and protein metabolism to increase nutrient supplies to the muscles, preparing the body to respond quickly and efficiently. A healthy stress response is characterized by an initial spike in cortisol levels followed by a rapid fall in those levels as soon as the threat is over. Figure 2 In the short term A), when faced with a stressful situation (such as a night of heavy drinking), the body’s normal physiological balance is altered but quickly recovers once the stressor is removed. If the stressor continues over time (such as long-term heavy drinking) B), the demands on the body’s systems are increased, making it harder for the body to regain its physiological balance. In response, the body simply “resets” its balance point, to a less optimal level of functioning. As shown in figure 2, long-term, heavy drinking can actually alter the brain’s chemistry, re-setting what is “normal.” It causes the release of higher amounts of cortisol and adrenocorticotropic hormone. When this hormonal balance is shifted, it impacts the way the body perceives stress and how it responds to it.21,22 For example, a long-term heavy drinker may experience higher levels of anxiety when faced with a stressful situation than someone who never drank or who drank only moderately. In addition to being associated with negative or unpleasant feelings, cortisol also interacts with the brain’s reward or “pleasure” systems. Researchers believe this may contribute to alcohol’s reinforcing effects, motivating the drinker to consume higher levels of alcohol in an effort to achieve the same effects. Cortisol also has a role in cognition, including learning and memory. In particular, it has been found to promote habit-based learning, which fosters the development of habitual drinking and increases the risk of relapse.23 Cortisol also has been linked to the development of psychiatric disorders (such as depression) and metabolic disorders. These findings have significant implications for clinical practice. By identifying those patients most at risk of alcohol relapse during early recovery from alcoholism, clinicians can help patients to better address how stress affects their motivation to drink. Early screening also is vital. For example, Veterans who turn to alcohol to deal with military stress and who have a history of drinking prior to service are especially at risk for developing problems.24 Screening for a history of alcohol misuse before military personnel are exposed to military trauma may help identify those at risk for developing increasingly severe PTSD symptoms. Interventions then can be designed to target both the symptoms of PTSD and alcohol dependence.25 Such interventions include cognitive–behavioral therapies, such as exposure-based therapies, in which the patient confronts the cues that cause feelings of stress but without the risk of danger. Patients then can learn to recognize those cues and to manage the resulting stress. Researchers recommend treating PTSD and alcohol use disorders simultaneously25 rather than waiting until after patients have been abstinent from alcohol or drugs for a sustained period (e.g., 3 months). Although the link between stress and alcohol use has been recognized for some time, it has become particularly relevant in recent years as combat Veterans, many with PTSD, strive to return to civilian lifestyles. In doing so, some turn to alcohol as a way of coping. 1Keyes, K.M. ; Hatzenbuehler, M.L. ; Grant, B.F.; and Hasin, D.S. Stress and alcohol: Epidemiologic evidence. Alcohol Research: Current Reviews 34(4):391–400, 2012. 7Alim, T.N. ; Lawson, W.B. ; Feder, A.; et al. Resilience to meet the challenge of addiction: Psychobiology and clinical considerations. Alcohol Research: Current Reviews 34(4):506–515, 2012. 8Stephens, M.C., and Wand, G. Stress and the HPA axis: Role of glucocorticoids in alcohol dependence. Alcohol Research: Current Reviews 34(4):468–483, 2012. 9Herman, J.P. Neural pathways of stress integration: Relevance to alcohol abuse. Alcohol Research: Current Reviews 34(4):441–447, 2012. 12Clarke, T.-K.; Nymberg, C.; and Schumann, G. Genetic and environmental determinants of stress responding. Alcohol Research: Current Reviews 34(4):484–494, 2012. 13Moonat, S., and Pandey, S.C. Stress, epigenetics, and alcoholism. Alcohol Research: Current Reviews 34(4):495–505, 2012. 18Tanelian, T. , and Jaycox, L.H., Eds. Invisible Wounds of War: Psychological and Cognitive Injuries, Their Consequences, and Services to Assist Recovery [article online], 2008. Santa Monica, CA: Rand Corporation. Available from: http://rand.org. Accessed August 29, 2008. 19Higley, A.E; Koob, G.F.; and Mason, B.J. Treatment of alcohol dependence with drug antagonists of the stress response. Alcohol Research: Current Reviews 34(4):516–521, 2012. 20Sinha, R. How does stress lead to risk of alcohol relapse? Alcohol Research: Current Reviews 34(4)432–440, 2012. 23Wand, G.S. Alcohol, the hypothalamic-pituitary-adrenal axis and the hormonal tolerance. In: Zakhari, S., ed. Alcohol and the Endocrine System. NIAAA Research Monograph No. 23. Bethesda, MD: National Institute on Alcohol Abuse and Alcoholism, 1993, pp. 251–270. 25Brady, K.T., and Back, S.E. Childhood trauma, posttraumatic stress disorder, and alcohol dependence. Alcohol Research: Current Reviews 34(4):408–413, 2012. 26Anthenelli, R.A. Overview: Stress and alcohol use disorders revisited. Alcohol Research: Current Reviews 34(4):386–390, 2012. Source material for this Alcohol Alert originally appeared in Alcohol Research: Current Reviews, 2012, Volume 34, Number 4. 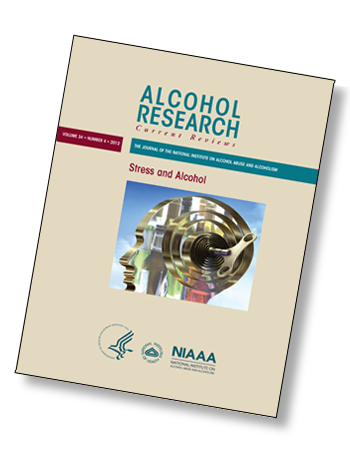 Alcohol Research: Current Reviews, 2012, 34(4) summarizes the latest findings on the link between stress and alcohol. Articles examine different sources of stress, such as childhood abuse and trauma, post-traumatic stress disorder, and comorbidity. Other topics explore how stress influences the development of alcohol abuse and dependence, and the impact this has on treatment and recovery. The issue concludes by looking at the role of genetics, epigenetics, and the environment in the stress response. Full text of these publications is available on NIAAA’s World Wide Web site at www.niaaa.nih.gov.